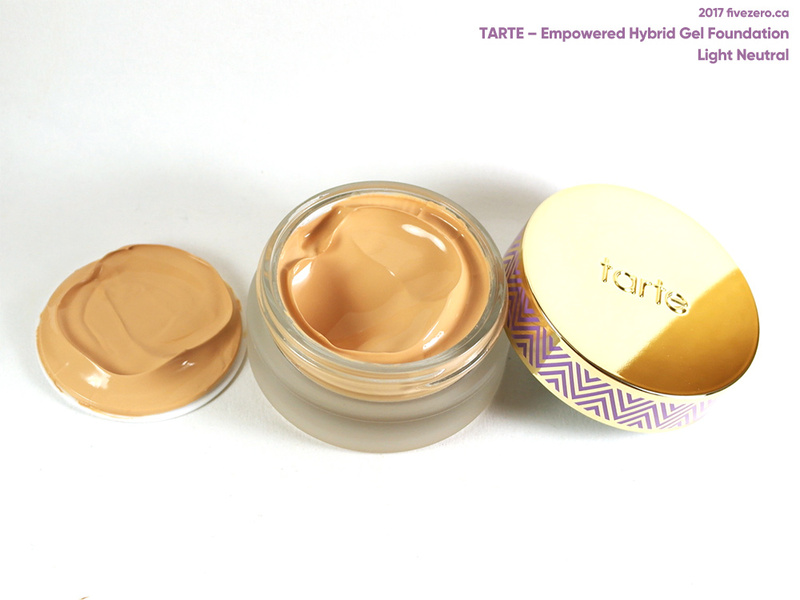 Last month, I jumped on tarte’s Custom Beauty Kit deal and chose their Empowered Hybrid Gel Foundation as part of my set. tarte only offered a limited number of foundation shades as part of the deal (which strikes me as very odd, as wouldn’t you want as many people as possible to be able to try out your foundation during such a sale?). Luckily, I was able to find what I thought would be a good match in Light Neutral, which is described as light with pink and yellow undertones. I’m about an NC25–30, but there was no Light-Medium Neutral, and Medium Neutral looked too deep. Normally I would also have gone with Light Sand instead, which is light with yellow undertones, but I found myself having issues with too-yellow foundations of late, so I went with the neutral shade, instead. I can’t remember whether Light Sand was one of the sale options, either. So, before the foundation arrived, I was worried that Light Neutral might be too light (as I often find myself in between the Light and Light-Medium shades of foundations) and too pink/peach. I had to remind myself, however, that my hands have gotten a bit tanner now that it’s spring/summer, and also a little more yellow-toned than my face. 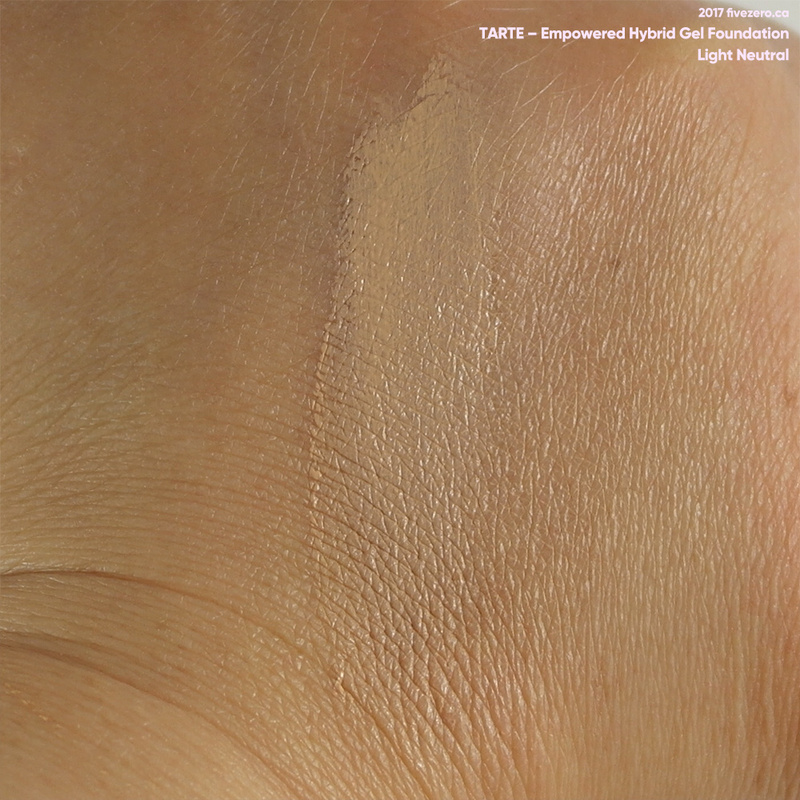 I initially did not love the texture of the foundation. It has a gel-like texture, as advertised, which felt a little “wet” and cool—and didn’t seem to sink very well into the skin. But, of course, hand skin is not the same as face skin, so I was still eager to try it on properly. I love Light Neutral! I really did not expect this, but it is a really good match for my skintone. I guess I was not far off when I was feeling annoyed about some of my other foundations looking too yellow. While the gel texture feels lovely and luxurious, I don’t especially like the way it sort of sits on top of my dry skin. It doesn’t meld in nicely. I have found that it looks a lot better if I’ve used more layers of moisturizer, first, so that’s what I have to remember to do whenever I use this. It’s a bit annoying since I don’t like to use as many layers in the morning, now that it’s summer. I have also decided that this foundation looks best used with a dry/drier makeup sponge (I use a beautyblender) or simply applied with fingers. I have not tried a makeup brush, but with a damp sponge, this foundation streaks badly. I think it works best patted on with a dry sponge, so it won’t streak. You also use less product that way, so win-win. If you can finally get the foundation to apply smoothly and evenly, it does give you a very pretty satin finish. Not too matte, not too shiny! I’m not sure I’d call it full coverage, but it is definitely a good medium coverage foundation. It’s not very layerable, though I guess you could try getting sheerer coverage out of it by mixing it with a moisturizer. I don’t know if this is because I’m wearing it on top of a serum (or two) + moisturizer + sunscreen, but it just doesn’t set. Touch it and it wipes away. So this means I also have to set it with some face powder—which, to be fair, I tend to do, anyway. But then it loses that nice satin finish. I could possibly try a primer underneath, but I’ll be damned if I have to add another layer to my face just to use this foundation. Longevity is not something I usually worry about too much with foundation, due to having drier skin. Yet, this foundation doesn’t wear very well on me. After about six hours, it starts to look weird: like it’s unevening itself all over my face. This is both with and without powder on top. It’s not horrid—it doesn’t make me look like the swamp monster or something—but it’s definitely not a long-lasting formula on me. Finally, let’s just talk a little bit about the packaging. 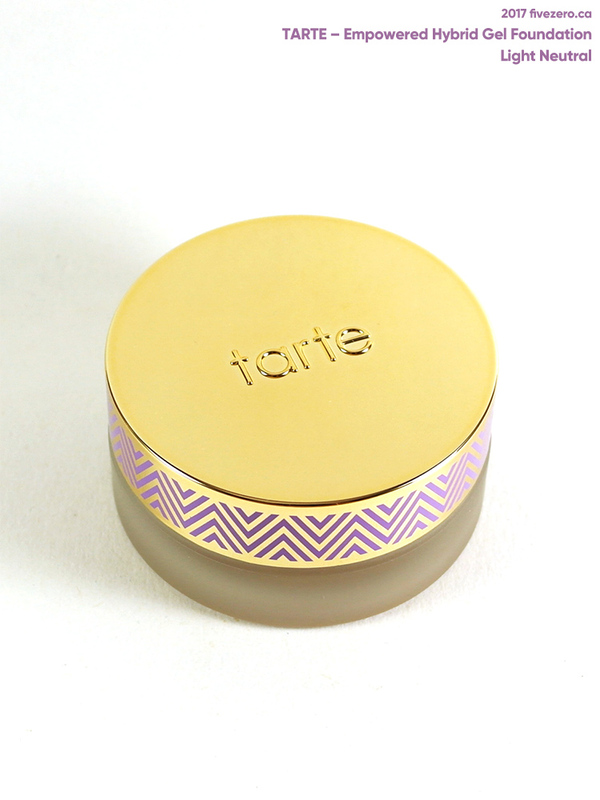 The jar is glass and the lid has a lovely design on it—as usual, tarte’s package design is beautiful! I don’t think jar packaging is ideal for foundations, though, mostly because it’s a little unhygienic, messy, and clumsy to use. The texture of this foundation would easily lend itself to a squeeze tube, which obviously doesn’t look and feel as luxurious as a glass jar, but it would be the most functional. I’m happy enough to use up this foundation, especially since I love the color match for my skin. I just need to remember to touch it up more often. 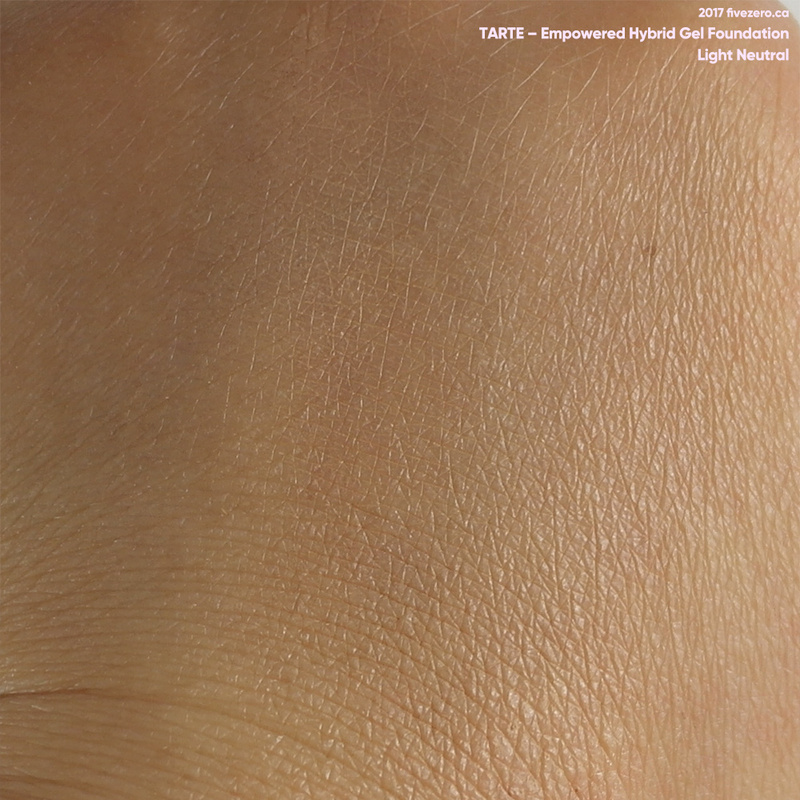 But the formula simply isn’t right for my skin type and I would not repurchase it. The very good color match does make me want to try the same shade in other tarte foundations, though! 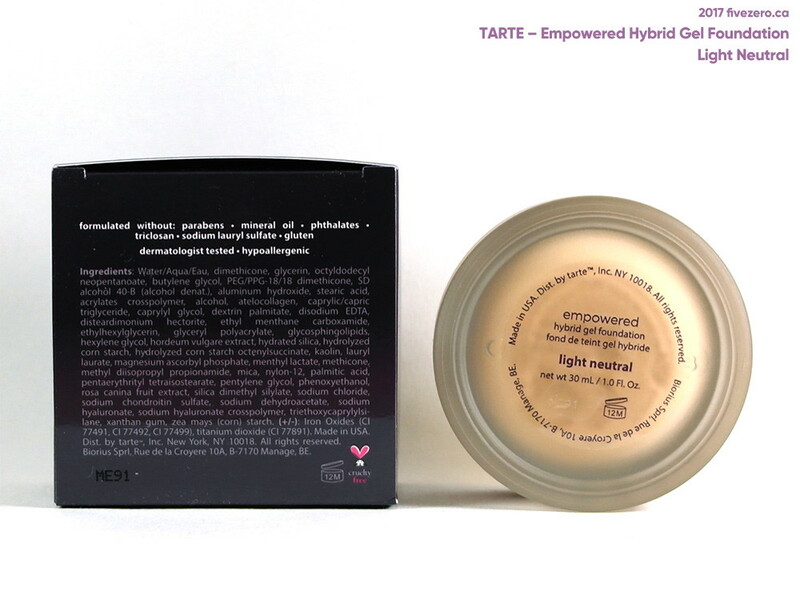 tarte Empowered Hybrid Gel Foundation contains 1.0 fl oz / 30 mL and retails for US$39/CA$51. It is made in the USA. tarte is cruelty-free. Love the packaging on this one; so pretty! Great review girly. Too bad that it didn’t work since the Shape Tape has taken over the beauty world! Anyways, wasn’t annoying picking product off of the tub? The colour looks pretty good – not too peachy. I often worry about that with non-Asian brands. Hmm the formula sounds tricky though. I’m not a fan of foundations that don’t dry down. Maybe this is better as a winter foundation? The packaging is eye catching but yeah… tubs aren’t the best. I have that Revlon creme foundation in the tub – I really like the foundation but not the packaging so much. That is really too bad that it just doesn’t seem to dry down! I hate that feeling on my skin. It does seem like a good colour match for you though. Maybe it will be better as a winter foundation? How annoying that it just sat on top of your skin – I would have expected a gel to absorb and melt into your skin. I have combo skin that leans to more dry and I always have great results with gel moisturizers so I would have assumed this would have worked well. Pretty packaging though! I highly recommend investing in the custom spatula brush that was designed for this foundation, it’s amazing! It buffs the foundation into the skin really well.